This is our new website page where we post information about other shows PSAA Artists are doing, put up individual website information, and note news about individual member artists. For the month of April, Karen Kolb will be exhibiting her artwork at the Little Egg Harbor Library with a reception on April 17th, 6pm-8pm. Karen works in watercolor and gouache showing harmony of colors. Karen is a world traveler and many of her paintings depict those travels especially in France. For the month of May PSAA artists exhibiting at the Little Egg Harbor Library will be: MaryBeth McCabe, Nancy Lang, Kelly Sterr and Clara Beym. The PSAA reception will be May 1st at the Library 6pm to 8pm. Please attend the receptions to show support for our fine artists who are exhibiting. 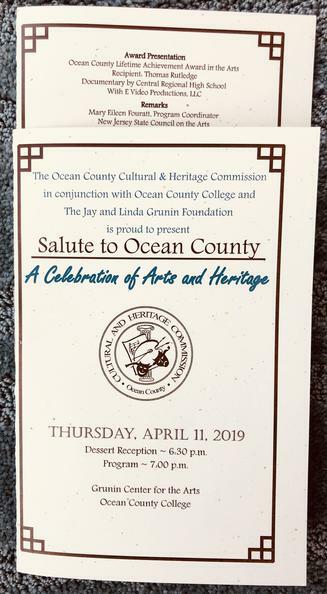 Photos from Thursday evening’s (April 11th) “Salute to Ocean County - A Celebration of Arts and Heritage” held at the Grunin Center for the Arts at Ocean County College. 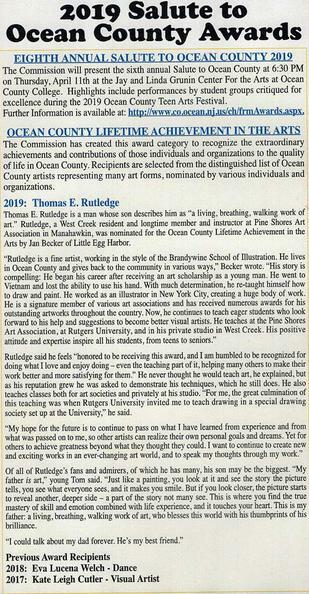 One of the highlights of the annual entertaining program was the presentation of Ocean County Lifetime Achievement Award in the Arts to Tom Rutledge. A short documentary film on Tom’s life was shown to a packed auditorium of many of Tom’s students, colleagues and family members. 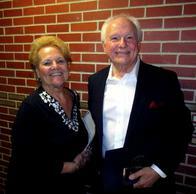 The video included filmed segments of a recent PSAA class Tom taught as well as statements made by class members and family members including wife Barbara. Tom was clearly appreciative and humbled by the award and ceremony, and Barbara and the rest of the family couldn’t have been prouder!